Get the prompt towing services and reliable auto repairs you need in one location. Dean’s Towing & Auto Service in Ellensburg, WA, offers 24/7 towing services, hauling your car to their shop, patching it up, and getting you back out on the road quickly. Family owned and operated since 1983, this full-service company offers a wide selection of auto repairs, including: Oil changes Engine repair Brake service Transmission service Pre-purchase inspections With more than 29 years of experience, their qualified drivers and knowledgeable mechanics can handle every auto problem they encounter with ease. As your local authorized U-Haul® dealer, they also provide affordable moving solutions and supplies if you’re moving to or from the area. For 24/7 roadside assistance you can count on, choose Dean’s Towing & Auto Service, Kittitas Valley’s premier choice for auto repair and emergency towing services. 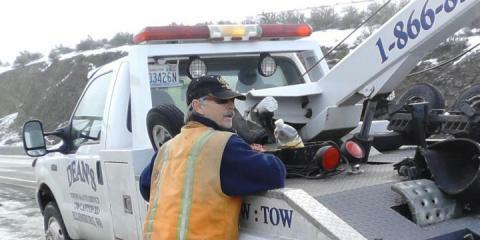 Call (509) 925-4869 to schedule an appointment or request a tow or visit them online for more information today.